I may be a college student on a budget but I still live large. In culinary terms, that is. I’ve had some classy friends here in Oz, and they’ve helped to class me up a bit. 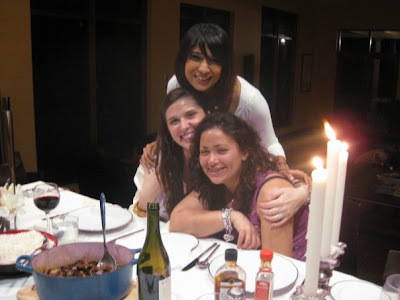 Here are some of the fancy pants meals I’ve had with my girlfriends, starting with the fanciest pants meal of all: Meagan’s fabulous French birthday feast. My girl Megastar is a self-proclaimed food Francophile. So for her birthday she decided to treat us all to an elaborate French feast. Actually, she decided to “oversee” us while we created for her an elaborate French menu of her choosing. We started early shopping for ingredients in the markets. We’d been dying to go to Bottega Rotolo, a specialty foods shop in Norwood. Bottega, as all the “in-the-know” folk call it, has a temperature controlled cheese room that made me drool. I also drooled over the lobster tail that was soon to be transformed into a lobster bisque. And general droolage over the bounty of fresh veg. First course was a lobster bisque drizzled with tarragon garlic oil and cream. Then came the filet au poivre bathed in a cognac mushroom cream sauce, bay-scented gratin dauphinoise with a Gruyere crust, glazed torpedo carrots, buttered asparagus and haricots verts. Dessert numero uno was a Paris-Brest a la Amy, a baked almond-topped choux pastry ring split and filled with a praline buttercream. Dessert numero dos was a platter with muscatelles, grapes and pears, the prized Epoisses, bleu de Basques, and a caprinelle from the Pyrenees. Certainly not a meal I eat everyday! I consumed more butter and cream during that meal than I have in all the rest of the meals I’ve eaten in Oz combined. Meagan continued the French theme in her first major cooking experiment. I bought her Julia Child’s Mastering the Art of French Cooking for her birthday, knowing that if you can’t cook from a Julia recipe, well, give it up, cuz you just can’t cook. Meagan’s bouef bourginon was SPECTACULAR! Cooked with love and some extra fatty pork belly (Meagan’s own flourish! ), it was a major success. I also must mention our starter for the evening. Jackie just casually whipped together the most amazing salad I can remember having in awhile. She layered smoked salmon, asparagus, arugula, and roasted kipfler (fingerling) potatoes on a bed of avocado puree and plopped a generous dollop of caviar on the top. What a treat to start off a night that I’ll never forget. 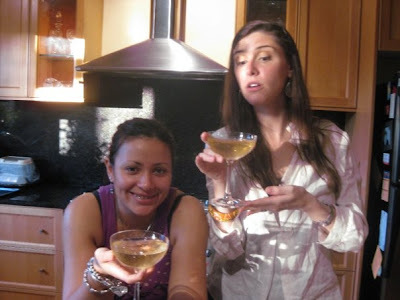 Jackie found old timey champagne glasses that day so we daintily sipped champagne, partyin’ like it was 1799. He-llo! Good mornin’! Ohayo gozaimazu! Buenos dias! Guten morgen! Buon giorno! G’day mate! It's been awhile since I posted so I feel compelled to go on…. How about high tea to celebrate my engagement? That’s pretty fancy schmancy, huh? And oysters and champagne by the sea with my homey g Meagan? I suppose a lunch of chocolate cakes and shakes at the Lindt café in downtown Sydney qualifies as fancy schmancy, seeing as we were surrounded by “suits” and “ladies who lunch”? And the crepes and Belgian beer dessert I made for Phil on one of his visits? Meagan frolicking on the grounds of Carrick Hill is classy times two. And finally, one of my favorite meals I made for the girlies goes into this category cuz they enjoyed it so much. Calamari ripieni, calamari stuffed with fennel and breadcrumbs and pancetta and garlic and herbs, braised in a red wine tomato sauce and served with fried polenta triangles. Followed by a caponata (eggplant, onions, capers, olives, tomatoes, basil, etc.) topped with grilled swordfish. Jeez gals we ate good when ya'll were here! Now that you’re gone it’s spaghetti-Os and beans for me. Wait a minute, it just occurred to me that this post might be completely inappropriate during a recession - shameless gluttony... sorry. But, well, life is about priorities, and I don't shop or gamble or own any material possessions to speak of (except some pots and pans and a pile of cookooks). And I really do eat a lot of beans. I just received your card and your happy news! Thank you very much for bringing me the happiest news! I do not know whether I can write here about it or not. I always look into your web site and enjoy your photos of dishes. Why do you have such a talent to find a lot of super foods? I look forward to finding another great dishes in your web site.